just one step outside any building of Venice is enough to drown Dario Camuffo in a sea of worries. Unlike those in power, he is unable to shut out a harsh reality -- the rising waters of the Adriatic Sea slowly besieging every corner of his beloved city. The Venetians had always proudly spoken of being wedded to the Adriatic, as it had brought them wealth. Today, murky water intimidates the 1,582-year-old bride. Traipsing wearily beside the romantic waterways and through winding alleys, Camuffo regularly watches workers raise the sidewalks along the canals, and rescue most of the city's 450 bridges. Like many others, he can't do much, except mutely witness the downfall of the imposing palazzos and squares. He finds solace in the fact that the architectural splendour can still be numbered as amongst the world's loveliest. If cities could be compared with flowers, then Venice is like a rose, which even while dying is as beautiful as ever. To most experts, its end is inevitable -- it is built on 100 islands in a lagoon, making it highly vulnerable to the adverse outcomes of climate change, including overflowing waterbodies. Land subsidence, too, compels the mammoth sea to engulf the 'sanctuary', built by refuges fleeing from barbarian invaders. Numerous studies have hinted at the catastrophe. But they all are based on recent data. Regular recordings of the sea level started only in 1872. Such short-term data is considered inadequate by scientists to predict future trends. The only hint of the imminent disaster, at present, is the increase in high tide incidences. A good example is the happenings in St Mark's Square -- the most popular, and also the lowest, spot of the city. In the early 1900s, high tides swept St Mark's about 0.2 times a year. In the 1950s, seawater swamped it once every year. Now, the soaking occurs around three times annually. However, many individuals assert that such events are not unusual -- Venetians have been battling waves and high tides since the city was established in the 5th century during the collapse of the Roman Empire. The divided opinions, along with the missing links of the past, have become the perfect excuse for those at the helm to evade taking steps to be prepared for what lies ahead, leave alone evolving a constructive action plan to save the city. As a scientist, Camuffo cannot afford to lull himself into a false sense of security. He, forever, is busy in his quest to document the wrath of climate change. His only distraction is art, paintings in particular. And it was the paintings that unknowingly came to the rescue of the city 10 years ago. How doubts got sunk On what was just another day in 1993, after his hectic work schedule at the Institute of Atmospheric Sciences and Climate, Camuffo started reading the biography of the great painter Canaletto (nickname of Giovanni Antonio Canal; 1697-1768). Like numerous other artists of his era, Canaletto needed a quick and easy way to sketch his paintings to keep the money pouring in; therefore, he used the portable camera obscura -- a lens that projects images directly on to sketchpads. The trick, described by Leonardo da Vinci five centuries ago, enables to reproduce accurate urban landscapes, complete with the lines of green scum formed by algae left on canal-side buildings by the retreating high tides. The piece of information intrigued Camuffo. A further dig into the annals of history revealed another pleasant surprise: Canaletto's lesser-known pupil, Bernardo Bellotto (1722-1780), also used the camera obscura. This was enough to propel Camuffo into action. He decided to use the paintings as proxy data. Of particular help, he conjectured, would be the brown-green algae belt, which are considered as the best biological indicator of the average high tide level over a period of time -- with an increase in high tide events, the algae belt becomes bigger. After teaming up with his colleague Giovanni Sturaro, Camuffo commenced his task. The foremost aim was to closely scrutinise all the paintings of both the artists. While rummaging through endless catalogues and collections, the twosome found some 200 views of Venice; but most could not be used either due to the absence of a clear indication of the algae belt, or because the buildings depicted had been demolished or reconstructed. In the end, Sturaro and Camuffo zeroed down on 11 works -- the ones that depicted buildings that remained unaltered since the 18th century, and on which the algae belt was clearly visible, even to a naked eye. A computer imaging process was used to help them navigate through the maze of the past and present events. Like treasure hunters, they toiled for years, for they were convinced about their notion. In early 2003, the efforts finally paid off -- they were able to trace sea level changes from 1727 to 1872. Collation of the results with the available data of sea level changes after 1827 made many dilettantes finally admit the obvious. 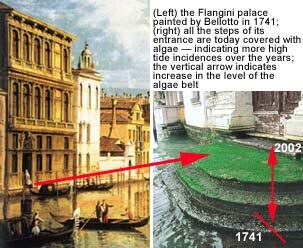 The algae belt was found to have increased by 69 centimetres since the first half of the 18th century. The sea level has risen by up to 0.6 metres since Canaletto's time, or by 2.3 millimetres per year. Overall, Venice has lost 60 centimetres of its historical buildings during the last three centuries. "There is now enough evidence to convince anyone of the looming catastrophe. The situation must not allowed to be worsened if Venice is to be left to the future generations," says Camuffo. An ideal solution, he asserts, would be to put an end to the number crunching charade, and raise the city at least 30 centimetres by pumping seawater deeply into the subsoil. This is a must, as the city has lost its capacity to cope. Originally protected against groundwater rise by a layer of non-permeable Istria stone, the palaces are now at risk, as the protective belt has sunk with the city. The bricks and plaster may also soon give in due to the salt crystallisation process of the water. Camuffo believes that Venetians can find a way to race against the tides, instead of running away from the problem -- the city's population has halved in the past two decades. "The moto ondoso -- the motion of the waves -- perhaps cannot be changed. What can change is our attitude."